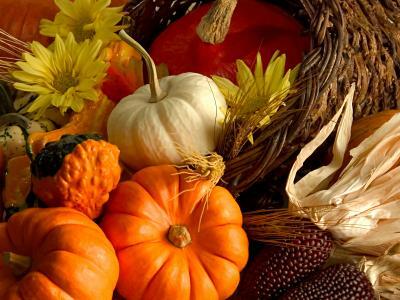 When fall is right around the corner, many people like to change their home décor to reflect the new season. Halloween decorations are especially popular during the months of September and October, but coming up with a way to incorporate these items into your current interior design scheme can sometimes be tricky. Kimberly M. Stone, owner of the interior design firm Adore Your Décor and author of the FabJob Guide to Become a Home Stager or Redesigner, knows how challenging it can be to come up with stylish decorating ideas for the holidays. Halloween, in particular, presents special difficulties since many traditional decorations are either too childish or too ghoulish for modern home décor schemes. If you're interested in stylish Halloween decorations, Ms. Stone recommends using a combination of flowers and sweets to jazz up your home. "To add that orange glow without a jack-o-lantern, try beautiful roses bunched in sweet, full bouquets," she said. "If roses aren't your thing, look into the myriad of different species available at the market or the local flower shop - such as gerbera daisies, sunflowers, carnations, and lilies. These striking orange and yellow flowers will make a bold, elegant statement. There are also classic fall mums, of course, which will add great seasonal color. Place whole oranges, slices, or peels in floral water for dramatic effect in clear vases." Kids love Halloween candy, but sweets are fun for adults too! "Replace everyday objects with Halloween treats," she said. 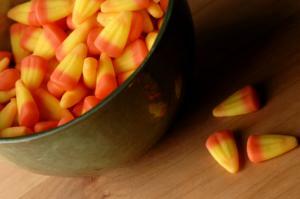 "Try using candy corn in place of rocks or sand in candle dishes. 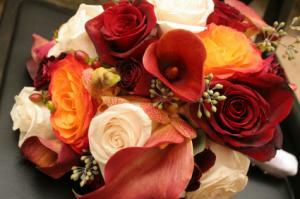 Candy corn is also great as filler for a floral arrangement in a glass vase. Remember those strings of popcorn used as garland on Christmas trees? To make a spooky garland, carefully string together wrapped bubble gum pieces and lollipops along with a variety of other wrapped treats. Kids of all ages will enjoy this festive sight." If you're feeling extra adventurous, Ms. Stone suggests going cultural with a celebration sure to grab the attention of friends and family. Day of the Dead, or Día de Muertos in Spanish, is an ancient commemoration of deceased ancestors that is celebrated on All Saints Day and All Souls Day, as well as sometimes on Halloween itself. In the Latin American countries where it is usually observed, shrines are built and offerings of food, drink, and gifts are left at churches and cemeteries. This is a joyful occasion which honors the lives of those who have passed. 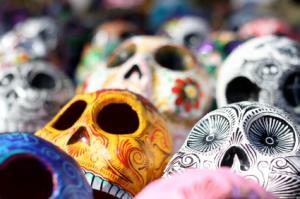 The colorfully decorated art objects include skulls and other effigies which are sometimes made of sugar. When the typical pumpkins and gourds have worn out their welcome, try some creative ideas to jazz up your Halloween decorating. You're only limited by your imagination and what you can find at your local grocery store or what you already have on hand.